The terrible news keeps on coming from Nigeria’s embattled northeast. Two suspected child suicide bombers reportedly blew themselves up in a crowded market on Sunday – the second such attack in two days linked to Boko Haram in which young girls were strapped with explosives. Meanwhile, the Islamic extremist group has maintained the momentum of its more conventional attacks, capturing the town of Baga last week on the border with Chad and deliberately executing civilians (earlier reports of up to 2,000 dead by Amnesty International have been disputed by the military. But the true figure remains unknown). IRIN considers five key questions as Nigeria embarks on an election campaign against the grim backdrop of continued violence. Do the latest attacks indicate a change in Boko Haram strategy? No. The use of girl suicide bombers is not new. In December, a 13-year old wearing a suicide vest entered a market in the northern city of Kano, but she did not detonate her explosives: the teenager had been ordered to carry the bomb by her father, a Boko Haram member. Two other teenage girls deployed by Boko Haram at the same time did complete their mission, killing four people and themselves in the blasts. Neither is the military’s failure to hold territory anything new. Boko Haram declared a caliphate in captured territory in August last year, including 10 major towns in Adamawa, Borno and Yobe states. In Borno, Boko Haram holds 13 out of 27 Local Government Areas (LGAs), and two LGAs in both Adamawa and Yobe, although the situation is extremely fluid. The military’s response has often been either silence or bluster. The trending hashtag #JeSuisBaga was a poignant comment on the high-profile reaction of the French government (and the world, including the Nigerian authorities) to the Charlie Hebdo killings in Paris, and the hush of Abuja to the tragedy in Baga. Boko Haram seems to have singled out the town for special punishment after capturing it on 7 January. 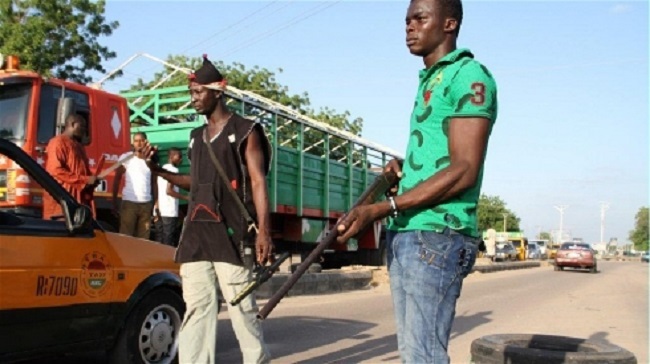 That may be due to the defiance of the community-rooted vigilante “Civilian JTF”, which reportedly had done much of the hard fighting to try to hold the town after the military barracks fell on 3 January. The irony is the Nigerian military also laid waste to Baga, allegedly killing 183 people in a reprisal raid in 2013, according to Human Rights Watch. That was during an earlier phase of the war, when the government’s hearts-and-minds campaign amounted to a self-defeating, insurgency-stoking, brutal shock-and-awe strategy targeting entire communities, with little differentiation between civilians and combatants. What is life like in Boko Haram territory? Details are sketchy. The reaction of most people to the arrival of Boko Haram is to flee; and the Salafist group is not exactly welcoming towards journalists. The accounts that do emerge suggest that, as promised, the militants impose a strict version of Sharia law, which has included amputations. There have also been reports of forced marriages by Boko Haram fighters. Movement is controlled with vehicles banned, apparently to prevent escape. The squeeze on local markets as a consequence of the closure of transport links has been exacerbated by a system of price controls. In some cases traders have had their wares “liberated” and distributed. There are hints that Boko Haram does not have enough men to garrison its towns effectively, and occupation therefore quickly dwindles to a few road blocks, with no real attempt at an alternative administration. So, life continues pretty much as normal if you are, for example, a traditional farmer. Why is the military’s performance so lamentable? Nigeria is proof that military spending does not necessarily buy security. The 2014 defence budget was $2.1 billion and the overall security allotment $5.8 billion – the largest slice of the government’s expenditure pie. And yet the regular excuse is that its soldiers are out-gunned by Boko Haram, despite the helicopter gunships, ground-attack aircraft, and surveillance drones in the official inventory. Closer to the reality on the ground was the report of a recent court martial, in which soldiers complained they were issued with 60 rounds of ammunition and expected to transport themselves to the front in a tipper truck. They were owed five months’ back pay. Corruption is said to the biggest enemy, with money and fuel meant for the troops siphoned off by senior officers. The repeated failure to destroy munitions and equipment before positions are surrendered to Boko Haram is another factor, as is – sadly, given Nigeria’s peacekeeping pedigree – military incompetence. When the troops are well led and properly supplied they win their battles. But there have been repeated reports of the military even failing to make use of reliable intelligence provided by its allies. And now the government has splurged on opaque defence contracts, with more helicopter gunships, mine-resistant armoured vehicles and possibly a squadron of new, never-before flown by any other air force, counter-insurgency aircraft. What is the humanitarian fallout? The government says the fighting has displaced 1.5 million people within the country. There are questions over the methodology used by the National Emergency Management Agency, which produced that number, but the UN uses the figure. According to the Internal Displacement Monitoring Centre, people typically flee to the neighbouring states of Bauchi, Gombe, and Taraba, and to central Nigeria and the Middle Belt region. These areas, to a lesser extent, are also affected by violence, “increasing competition for resources between IDPs [internally displaced persons] and host communities in flashpoint areas”. Worsening food security in a region with already some of the worst nutrition and child mortality indicators in the country is another cause for concern. As a result of the disruption to local markets and the fall in agricultural incomes, the Famine Early Warning System Network has advised that “in the absence of well-targeted humanitarian assistance, as many as three million people will be unable to meet basic food needs by July 2015”. All this will have an impact on already dangerously charged and highly polarized elections on 14 February. The entourage around President Goodluck Jonathan, a southerner, has long whispered that Boko Haram has been a conspiracy by northern politicians to scupper his tenure. The populist theory prevailing in the north, which will vote in huge numbers for his rival Muhammadu Buhari, is that Boko Haram is the creation of the government to undermine their region. The Independent National Electoral Commission claims that 80 percent of the people entitled to vote in the northeast have their official voting cards – an almost incredible result given the extent of insecurity in the region. But there is confusion over how the poll can be run under the current electoral laws in conflict-affected areas. With the grubby history and perennial violence of Nigerian elections, it is unlikely that the ballot will be peaceful, or that either side will accept defeat with grace and sang-froid. Regardless of who is deemed the winner, there may well be unrest and bloody protest, from which only Boko Haram can profit. But the positive take is that there is a growing social and political consciousness demanding change. And if saner heads prevail, out of this process Nigeria’s democracy can emerge stronger, striking a more effective blow against extremism.